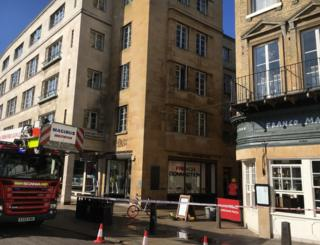 A fire in a building above a restaurant closed an area of Cambridge city centre for about six hours. Firefighters found the fire on the third floor of a building above Franco Manca pizza restaurant on Market Hill at about 10:55 GMT on Sunday. Road closures were put in place in and around the Market Square area and the public were asked to avoid the area if possible. Cambridgeshire Police said the street was reopened at about 17:00. The fire and rescue service said the fire was extinguished with a hose reel by 16:15. Station Commander Tony Burton said it was "a challenging incident" for the crews "due to the complex layout and age of the building". "The fire was started accidentally due to a build up of discarded smoking materials on the third floor of the building that had spread through the pipe work," he said. "This highlights how important it is for those that smoke to make sure they safely extinguish and discard any smoking materials in a metal container. Luckily on this occasion the fire was small and didn't result in any damage or injuries."